I was watching Legends of Aria from a distance for quite some time. 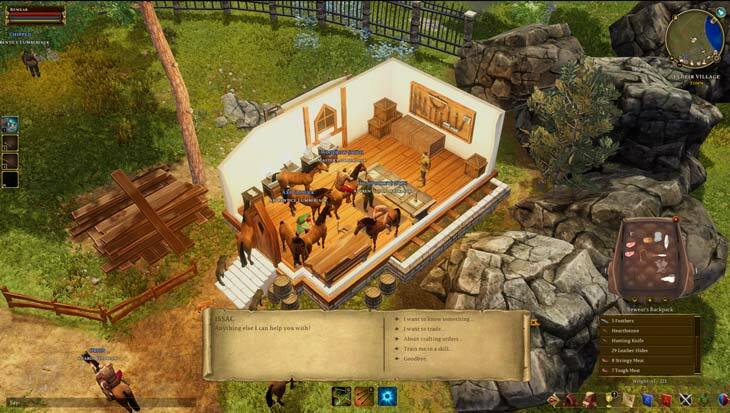 I've been burned by the games purporting to be a spiritual successor of the original MMOs. Haven't we all? After many of you messaged me or commented here on the blog about how much you were enjoying it, I decided now was a decent time to drop $30 and jump into the "early access" before the steam release. I just bought the game yesterday, so these are the preliminary thoughts from an absolute newb. I went into this without reading a single guide. I made my character with zero knowledge about how any of this works. I chose abilities that looked fun, and I jumped right into the world. I think this should be mentioned right up front. As I write this post, the game has been offline for 12 hours and are down until further notice. Lucky for them they delayed their Steam launch because they would be crucified at this point. In less than 48 hours of owning the game, they've had two major crashes, a 2 hour roll-back, and now a 12+ hour downtime. Expect this and I think it'll help your angst. Other problems include bugs, animation issues, and the general rough-around-the-edges experience I remember from UO. Even playing UO 20 years later there are still those problems. The comparisons you're seeing out there are very accurate. From the inventory and UI system, to the skill system, to just about every aspect of the game this is quite literally UO. I think that's why I was able to make a character and jump right in with relative ease, despite knowing nothing. I made an "advanced" character which means I got to pick my skills. I picked animal lore, animal taming, archery, and healing. I think now I'm also raising beastmaster and vigor. I'm going for a build where I tame lots of stuff and have it kill things. Crafting, harvesting, banking, housing, PvP, etc., etc., are all Ultima. If you enjoyed Ultima Online then you will feel right at home. Going into LoA knowing nothing gave me that "old school MMO" butterflies in my stomach feeling. It's almost a completely uncomfortable feeling of not knowing how to get out of a town, or where to go hunt, or where to go and do anything. Chat is limited to the people directly around you. What an isolating experience. You feel alone in the world when you can't chat with anyone. Yet when you go back into town and see people crafting, buying and selling, or simply socializing you quickly realize how important that lack of communication is for a sense of 'living breathing world'. Towns suddenly take on real characteristics as hubs of community. I want to write more on this in a later post. There's a lot more of Legends of Aria for me in the future. I'm going to continue playing as a noob and having no idea what to do. When I last played, I had just tamed 5 horses and brought them in to town to sell them to other players because I needed the coin to buy arrows. Is that efficient? I have no idea. What are the horses worth? No clue! But you know what? That's what I'm enjoying. My goals include getting a plot of land, finding a guild to join, raising my skills up to the point where I feel strong enough to explore, and eventually seeing the main areas of the whole world. If you're currently playing Legends of Aria, I would love to meet up and make some friends. I have a love/hate relationship when it comes to not “knowing” what to do in a game. I recently started playing ESO, and while its similar in a lot of ways, its also very-very different. There is a sense of wonder in all things I do, but I think the veteran in mean is constantly at odds with itself wondering if what I’m doing is worth it or not. Like I said, its a love/hate thing. You mentioned proximity based chat. That actually sounds really cool in an MMO. Really pushes people to gather in specific places. I like that concept as one of my biggest pet peeves is an MMO is a ghost-town “hub-city.” In WoW, people are typically at a variety of places, or simply flying high above the capital chatting to the entire zone. Proximity chat really emphasizes that feeling of adventuring out and being alone, and makes grouping up a lot more interesting. I might pick up this game alone on that just to see what its like.